The forecast for the day threatened showers so the 17 walkers who had assembled at Bruce’s Stone car park were keen to get started on what was to be, for some, a long and satisfying day’s walk. Isobel, Frances, Joanne, Andrea, Carl, Florence, Leslie, Brian (leading), Gordon and Debbie arrived at Bruce’s Stone car park looking forward to a good long walk! There were loads of other people I did not know except for one person who had been on a Portpatrick walk with us ages ago, plus Catherine from Port William who had walked with the Ramblers a couple of months ago. The group turned off to walk upwards beside Buchan Burn making good progress towards the Buchan Ridge. It was soon afterwards that they split into two parties, one reaching and enjoying the scenery at the top of Buchan Hill and the other pushing on upwards. I knew that Brian planned to include the Buchan Ridge in our walk and that he was not keen to be going from one loch to another as the route would be water logged! 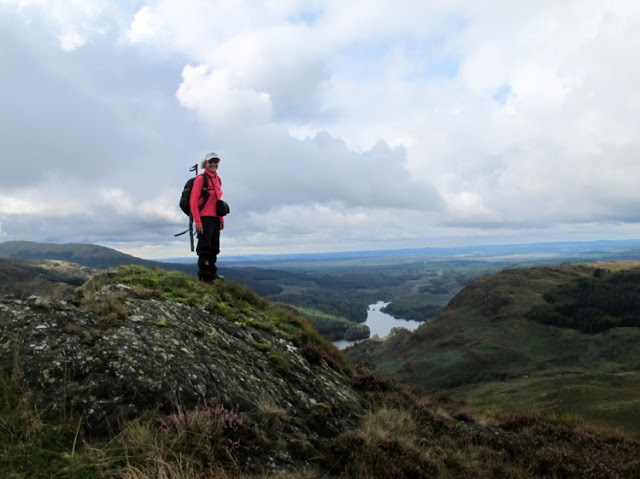 He announced that he intended going up Buchan Hill, having lunch by one of the loch’s (have not worked out how he would have done this yet) before heading up the Merrick. We set off at a fast pace, some of the walkers I did not know (I think some of them may have come with Gordon, from Ayrshire) helping to push the group on leaving Brian with the slower walkers. Catherine soon lagged behind and Carl stayed back with me as I tried to encourage her. Brian waited with Florence and Isobel until we had caught up and I told him that I would go to the top of Buchan Ridge with Carl and Catherine and then we would make our way back down. We eventually reached the summit but dropped down below it to have our lunch where it was more sheltered, about 12.15pm (much earlier than the rest of the group would be having theirs!) and we had brilliant views of the lochs below us. There was the occasional very light shower on the ridge but an early, leisurely lunch was enjoyed by those opting for time for photography and appreciating the views opening up below them of many lochs – Neldricken, Valley, Narroch, and Long and Round Lochs of Glenhead, and across to the Rig of Jarkness and beyond. 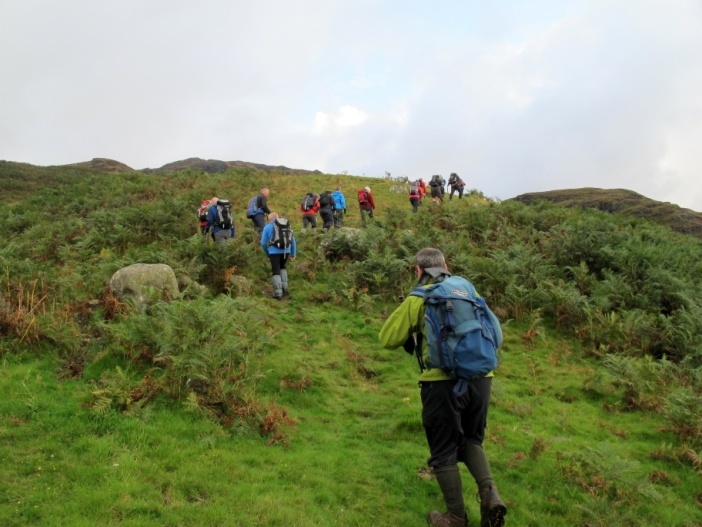 So far the walk had been fairly easy but the scramble down from the hill towards Gairland Burn redressed the balance – to say nothing of losing their balance occasionally, necessitating their descent on backsides occasionally, amid much hilarity and exclamations! We started to get cold so decided that we would head down from there to pick up the Five Lochs track and had a really horrendous descent – steep, tussocks, rocks, deep holes with water in them, heather, bracken, all conspired to make our downward journey a difficult one. However, we laughed as we fell, Catherine spent more time on her backside than in standing. The path they eventually reached looked at times much like miniature waterfalls and a lot of care was taken in negotiating it back down to the forest road before heading uphill to Bruce’s Stone, the sun shining and the rain having completely disappeared. It was a tremendous relief when we got down to the track even though we now had a long way to go along a rocky, boggy path. Catherine was shaking with the exertion – NOT with fear she told us! She was great fun to be with and she certainly needed her sense of humour today! Meanwhile the other group moved on steadily, working their way along Buchan Ridge and up beside a gully, pausing to look upon the rocky outline of the face of the ‘Grey Man of the Merrick’. It was a hard slog up this section to get to the summit of the Merrick, stopping just below it for lunch, giving them enough energy to continue! On reaching the cairn and trig point (843m) at the top, what little mist there had been earlier had evaporated. The clouds floated by as the views opened up and all of the Five Loch’s, plus many more lay below them and the Galloway Hills and beyond were seen in amazing detail. It was an easy stroll for a while after leaving the summit but a short climb back up brought the walkers to Ben Yellary from where Ailsa Craig and the Ayrshire coastline became more prominent. 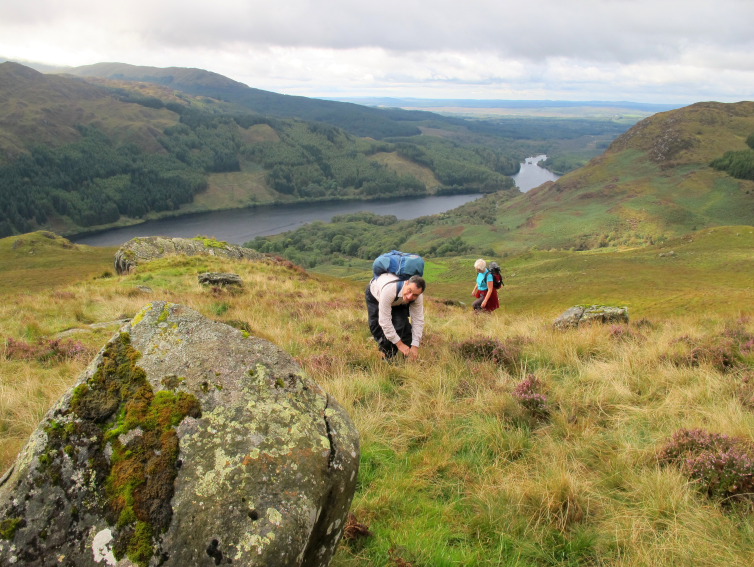 Following the descent from there, they ignored the pathway down towards Loch Trool and started to negotiate the boggy area, worsened by recent rain, to reach the rocky slopes of Benane with its scattering of lochans. 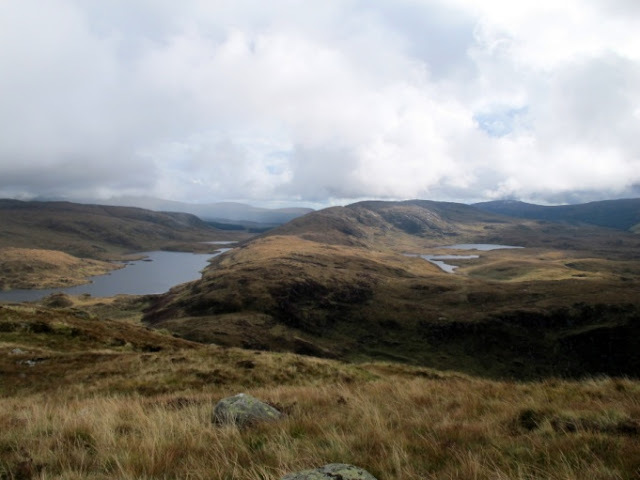 After their descent from there and reaching the forest road the group split into two, one of them opting to walk a short while along the road, turn off to follow the ‘Merrick’ track, past the bothy at Culsharg and to follow Buchan Burn down to Bruce’s Stone. The other group had an exhilarating scramble down the Fell of Esconcan which they all agreed added an exciting end to a wonderful walking day as from here the views of Loch Trool and its surrounding hills were ‘tremendous’!